Explain the relationship between instantaneous velocity, average velocity, instantaneous speed, average speed, displacement, and time. Calculate velocity and speed given initial position, initial position, final position, and final time. Derive a graph of velocity vs. time given a graph of position vs. time. Interpret a graph of velocity vs. time. Figure 1. 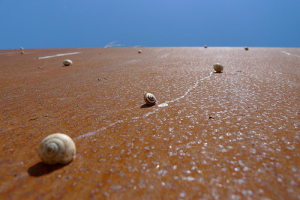 The motion of these racing snails can be described by their speeds and their velocities. (credit: tobitasflickr, Flickr). There is more to motion than distance and displacement. Questions such as, “How long does a foot race take?” and “What was the runner’s speed?” cannot be answered without an understanding of other concepts. In this section we add definitions of time, velocity, and speed to expand our description of motion. As discussed in Chapter 1.2 Physical Quantities and Units, the most fundamental physical quantities are defined by how they are measured. This is the case with time. Every measurement of time involves measuring a change in some physical quantity. It may be a number on a digital clock, a heartbeat, or the position of the Sun in the sky. In physics, the definition of time is simple—time is change, or the interval over which change occurs. It is impossible to know that time has passed unless something changes. The amount of time or change is calibrated by comparison with a standard. The SI unit for time is the second, abbreviated s. We might, for example, observe that a certain pendulum makes one full swing every 0.75 s. We could then use the pendulum to measure time by counting its swings or, of course, by connecting the pendulum to a clock mechanism that registers time on a dial. This allows us to not only measure the amount of time, but also to determine a sequence of events. Life is simpler if the beginning time is taken to be zero, as when we use a stopwatch. If we were using a stopwatch, it would simply read zero at the start of the lecture and 50 min at the end. If , then . Your notion of velocity is probably the same as its scientific definition. You know that if you have a large displacement in a small amount of time you have a large velocity, and that velocity has units of distance divided by time, such as miles per hour or kilometers per hour. The minus sign indicates the average velocity is also toward the rear of the plane. The average velocity of an object does not tell us anything about what happens to it between the starting point and ending point, however. For example, we cannot tell from average velocity whether the airplane passenger stops momentarily or backs up before he goes to the back of the plane. To get more details, we must consider smaller segments of the trip over smaller time intervals. Figure 2. A more detailed record of an airplane passenger heading toward the back of the plane, showing smaller segments of his trip. The smaller the time intervals considered in a motion, the more detailed the information. When we carry this process to its logical conclusion, we are left with an infinitesimally small interval. Over such an interval, the average velocity becomes the instantaneous velocity or the velocity at a specific instant. A car’s speedometer, for example, shows the magnitude (but not the direction) of the instantaneous velocity of the car. (Police give tickets based on instantaneous velocity, but when calculating how long it will take to get from one place to another on a road trip, you need to use average velocity.) Instantaneous velocity is the average velocity at a specific instant in time (or over an infinitesimally small time interval). Mathematically, finding instantaneous velocity, , at a precise instant can involve taking a limit, a calculus operation beyond the scope of this text. However, under many circumstances, we can find precise values for instantaneous velocity without calculus. In everyday language, most people use the terms “speed” and “velocity” interchangeably. In physics, however, they do not have the same meaning and they are distinct concepts. One major difference is that speed has no direction. Thus speed is a scalar. Just as we need to distinguish between instantaneous velocity and average velocity, we also need to distinguish between instantaneous speed and average speed. Instantaneous speed is the magnitude of instantaneous velocity. 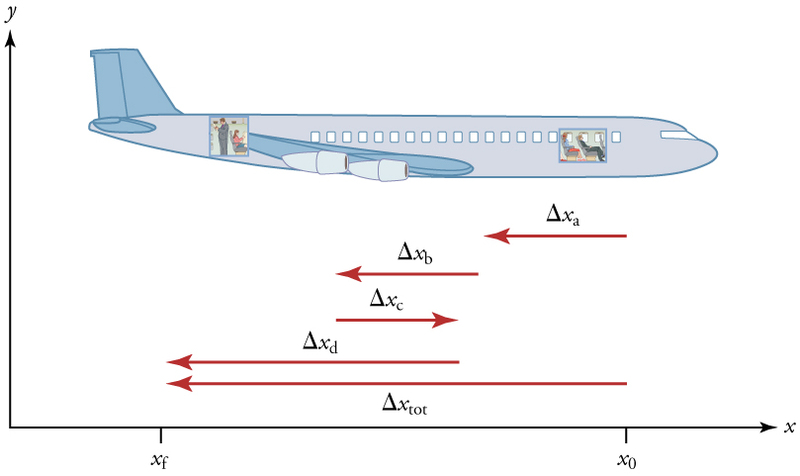 For example, suppose the airplane passenger at one instant had an instantaneous velocity of −3.0 m/s (the minus meaning toward the rear of the plane). At that same time his instantaneous speed was 3.0 m/s. Or suppose that at one time during a shopping trip your instantaneous velocity is 40 km/h due north. Your instantaneous speed at that instant would be 40 km/h—the same magnitude but without a direction. Average speed, however, is very different from average velocity. Average speed is the distance traveled divided by elapsed time. We have noted that distance traveled can be greater than displacement. So average speed can be greater than average velocity, which is displacement divided by time. For example, if you drive to a store and return home in half an hour, and your car’s odometer shows the total distance traveled was 6 km, then your average speed was 12 km/h. Your average velocity, however, was zero, because your displacement for the round trip is zero. (Displacement is change in position and, thus, is zero for a round trip.) Thus average speed is not simply the magnitude of average velocity. Figure 3. During a 30-minute round trip to the store, the total distance traveled is 6 km. The average speed is 12 km/h. The displacement for the round trip is zero, since there was no net change in position. Thus the average velocity is zero. Figure 4. Position vs. time, velocity vs. time, and speed vs. time on a trip. Note that the velocity for the return trip is negative. 1: A commuter train travels from Baltimore to Washington, DC, and back in 1 hour and 45 minutes. The distance between the two stations is approximately 40 miles. What is (a) the average velocity of the train, and (b) the average speed of the train in m/s? where is the final time and is the initial time. The initial time is often taken to be zero, as if measured with a stopwatch; the elapsed time is then just . The SI unit for velocity is m/s. Velocity is a vector and thus has a direction. Instantaneous velocity is the velocity at a specific instant or the average velocity for an infinitesimal interval. Instantaneous speed is the magnitude of the instantaneous velocity. Instantaneous speed is a scalar quantity, as it has no direction specified. Average speed is the total distance traveled divided by the elapsed time. (Average speed is not the magnitude of the average velocity.) Speed is a scalar quantity; it has no direction associated with it. 1: Give an example (but not one from the text) of a device used to measure time and identify what change in that device indicates a change in time. 2: There is a distinction between average speed and the magnitude of average velocity. Give an example that illustrates the difference between these two quantities. 3: Does a car’s odometer measure position or displacement? Does its speedometer measure speed or velocity? 4: If you divide the total distance traveled on a car trip (as determined by the odometer) by the time for the trip, are you calculating the average speed or the magnitude of the average velocity? Under what circumstances are these two quantities the same? 5: How are instantaneous velocity and instantaneous speed related to one another? How do they differ? 1: (a) Calculate Earth’s average speed relative to the Sun. (b) What is its average velocity over a period of one year? 2: A helicopter blade spins at exactly 100 revolutions per minute. Its tip is 5.00 m from the center of rotation. (a) Calculate the average speed of the blade tip in the helicopter’s frame of reference. (b) What is its average velocity over one revolution? 3: The North American and European continents are moving apart at a rate of about 3 cm/y. At this rate how long will it take them to drift 500 km farther apart than they are at present? 4: Land west of the San Andreas fault in southern California is moving at an average velocity of about 6 cm/y northwest relative to land east of the fault. Los Angeles is west of the fault and may thus someday be at the same latitude as San Francisco, which is east of the fault. How far in the future will this occur if the displacement to be made is 590 km northwest, assuming the motion remains constant? 5: On May 26, 1934, a streamlined, stainless steel diesel train called the Zephyr set the world’s nonstop long-distance speed record for trains. Its run from Denver to Chicago took 13 hours, 4 minutes, 58 seconds, and was witnessed by more than a million people along the route. The total distance traveled was 1633.8 km. What was its average speed in km/h and m/s? 6: Tidal friction is slowing the rotation of the Earth. As a result, the orbit of the Moon is increasing in radius at a rate of approximately 4 cm/year. Assuming this to be a constant rate, how many years will pass before the radius of the Moon’s orbit increases by (1%)? 7: A student drove to the university from her home and noted that the odometer reading of her car increased by 12.0 km. The trip took 18.0 min. (a) What was her average speed? (b) If the straight-line distance from her home to the university is 10.3 km in a direction south of east, what was her average velocity? (c) If she returned home by the same path 7 h 30 min after she left, what were her average speed and velocity for the entire trip? 8: The speed of propagation of the action potential (an electrical signal) in a nerve cell depends (inversely) on the diameter of the axon (nerve fiber). If the nerve cell connecting the spinal cord to your feet is 1.1 m long, and the nerve impulse speed is 18 m/s, how long does it take for the nerve signal to travel this distance? 10: A football quarterback runs 15.0 m straight down the playing field in 2.50 s. He is then hit and pushed 3.00 m straight backward in 1.75 s. He breaks the tackle and runs straight forward another 21.0 m in 5.20 s. Calculate his average velocity (a) for each of the three intervals and (b) for the entire motion. 11: The planetary model of the atom pictures electrons orbiting the atomic nucleus much as planets orbit the Sun. In this model you can view hydrogen, the simplest atom, as having a single electron in a circular orbit in diameter. (a) If the average speed of the electron in this orbit is known to be , calculate the number of revolutions per second it makes about the nucleus. (b) What is the electron’s average velocity? 1: (a) The average velocity of the train is zero because ; the train ends up at the same place it starts. (b) The average speed of the train is calculated below. Note that the train travels 40 miles one way and 40 miles back, for a total distance of 80 miles. 2.3 Time, Velocity, and Speed by OpenStax is licensed under a Creative Commons Attribution 4.0 International License, except where otherwise noted.